The Outside goes further where The Covered Pure Permanence, Kolp’s ToT-debut, ended. That means another forty minutes of rather traditional, Nordic-oriented Black Metal with a pounding rhythm, dark-melancholic melodies and grim decelerations. Hungary is a great country when it comes to this kind of ultra-dark bleakness, and albums like The Outside strengthen this statement. 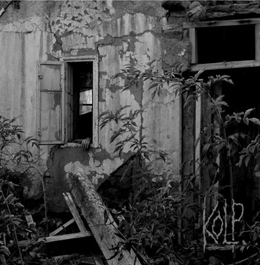 As a matter of fact, Kolp do not add something unique by performing tradition, yet they might distinct themselves by occasionally experimenting in different aspects: the tempo (with ultra-slow, lingering passages, balancing in between Sludge and Doom, and sudden blasts), therewithal the aural depiction of both Suicidal and Funeral Black, and the conscious decision to have the whole sound like this material had been recorded during the nineties in a studio like Grieghallen. The repetitive rhythm and melodic guitar lines are balanced nicely with the chilly, sulphured vocals, but when it comes to the major parts, there might be, no, there just is an imminent, manifest lack of originality. That brings me to the main negative remark to make: the prediction of the songs. One might have the impression having heard some of these songs before. But at the other hand, the sphere and the performance make me happily unhappy. And that’s what counts.